AN ATTEMPTED coup d'etat appears to have been thwarted in Ecuador, after police protests turned into an attempt to displace the centre-leftist President Rafael Correa. In dramatic scenes, he was rescued by loyal troops from a police hospital after what the BBC described as a 20-25 minute gun battle. While the USA publicly backs Correa, there are inevitably suspicions it has covertly supported a move against a leader who has blocked big business designs for the country and thrown out a US military base. Comments Al Giordiano of Narco News: "Every time there has been a coup d'etat in this hemisphere - from Chile 1973 to Honduras 2009 - it has been designed for its proponents to say 'oh, no, this is not a coup!'. "In what country do police forces shoot tear gas at their elected president unless they feel protected by much bigger forces? "There is already a disinformation campaign throughout the Internet - similar to what happened with Venezuela 2002 and Honduras 2009 - to claim that this is only a 'police protest'. "Use your common sense and instincts and knowledge of history. The same international gang of thieves that was behind the Honduras coup is now making its move to try to go after what it considers the 'second slowest zebra' of the center-left governments in the hemisphere. "Only this time, the zebra was fast enough and has the backing (so far) of the Armed Forces. But this is clearly an attempt at destabilization to make an elected government fall." WORKERS across Europe showed their anger on Wednesday at the 'austerity' measures being imposed across the contininent by the neoliberal ruling elite. Rioters set fire to a police car in Barcelona and another car was torched during angry demonstrations in Brussels. The general strike in Spain, against the 'socialist' government, saw massive protests and main roads blocked with burning barricades. Reports The Independent: "Rallies were called in 13 capital cities and millions of Spanish workers went on strike in a mass action that hobbled public transport, paralysed building work and left streets littered with uncollected rubbish. "Some 100,000 workers, including German miners and Polish shipbuilders, brought Brussels to a standstill to protest against savage spending cuts they claimed would make workers the biggest victims of an economic crisis that they are blaming on bankers and traders in the financial markets. "The protest came as the European Commission said it would introduce measures to force EU governments to rein in their finances and reduce deficits, or face financial penalties. "Unions said that 10 million people joined the general strike in Spain. Many small businesses shut their doors in solidarity, flights were grounded, television stations cancelled programmes and strikers scuffled with police. 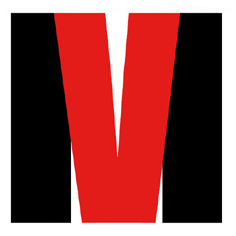 "Even the film director Pedro Almodovar suspended production on his latest project. During the morning rush hour, the streets of the Spanish capital were as empty as on a national holiday. "In Greece, hospital doctors stopped work for 24 hours and public transport was disrupted. In Slovenia, about half of public-sector workers remained on strike for the third day against a planned wage freeze. "In Ireland, one man blocked the entrance to the Dail, the Irish parliament, with a cement truck in a protest against the country's enormous bank bailouts. Written across the back of the lorry was: 'All politicians should be sacked'." NAXALITE rebels in India have killed three policemen and are holding another four hostage in the impoverished Bastar region of the Chhattisgarh state. Reports The Hindustan Times: "The killing and abduction comes a month after Maoists did the same with four policemen in Bihar’s Lakhisarai district. "Handwritten posters were found nailed to trees near some villages in the district, giving the state 48 hours to meet the rebels’ demands or have the remaining cops killed, senior police officials told HT on condition of anonymity." Meanwhile, a survey in Andhra Pradesh, where the state has claimed it has won the battle against the rebels, has shown huge popularity for the Naxalites, who champion the rural poor. Reports The Times of India: "India's biggest internal security threat, as the Prime Minister famously described it, may be worse than you thought. "That's because even in Andhra Pradesh, where the battle against the Maoists has apparently been won, it turns out that the government is losing the battle for the minds and hearts of the people. "Perhaps the most revealing answers are in response to questions on whether the Maoists — still better known as Naxalites in this belt — were good or bad for the region and whether their defeat by the AP police has made matters better or worse. "Almost 60% said the Naxalites were good for the area and only 34% felt life had improved since they were beaten back. "As for whether exploitation has increased after the Naxalite influence waned, 48% said it had against 38% who said it hadn't, the rest offering no opinion. "Those answers are buttressed by the responses to three other questions. The first of these was on whether the characterization of the Naxals as extortionists and mafia was accurate. Two-thirds disagreed. 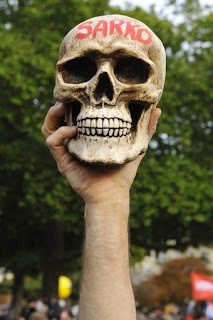 "An elaboration of this came in response to a slightly more open-ended question. Over half said the Naxalites worked for the good of the area, another one-third said they had the right intentions but the wrong means. Only 15% were willing to describe them as just goondas [thugs]". 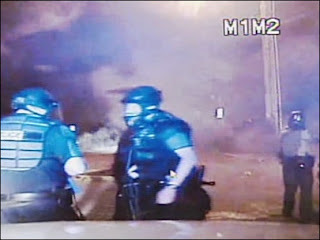 HUNDREDS of young people battled riot police in a university city in the north-west of the USA at the weekend. The clashes took place in Eugene, Oregon, which has a longstanding anarchist presence. Police used tear gas against the youngsters, who had been out partying. Reported Fox 12: "Police say it's unclear what touched off a 400-strong riot in the college town of Eugene that led to nine arrests. "No injuries were reported after people spilled out onto a residential street Friday night, throwing bottles at officers, breaking car windows and tearing down street signs in the town that's home to the University of Oregon . "Eugene police spokesman Doug Mozan says if people start to spill into the street and get drunk enough in the area home to many student renters, 'sometimes they engage in group-think.' He says 'it was like a flash mob, almost'." FRENCH resistance to neoliberal ''austerity' measures is gaining new momentum. Reports Reuters: "French labour unions, heartened by large street marches against pension reform, agreed on Friday to call for another protest on Saturday Oct. 2 and a follow-up day of strikes and protests on Tuesday Oct. 12. "The move, announced in a statement after union leaders met in Paris, raises the stakes in a showdown with President Nicolas Sarkozy before a pension reform bill that would raise the retirement age to 62 from 60 is debated on Oct. 5 in the upper house. The government continues to rule out any retreat on the plans. "Between one and three million people took to the streets across the country on Thursday to denounce Sarkozy's pension plans. The turnout was 2.9-3 million according to unions and 997,000 according to police." PROTESTS erupted in Egypt this week in opposition to its dictatorial neoliberal regime. Reported The Guardian: "Clashes broke out in central Cairo after hundreds of Egyptians took to the streets to protest against what they claimed were plans for the president's son to assume power. 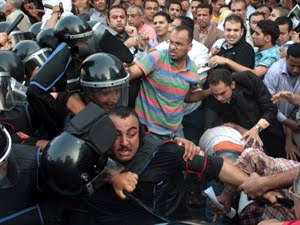 "Lines of riot police encircled and attacked demonstrators opposed to Gamal Mubarak outside Abdeen palace, the site of a 19th-century nationalist revolt against monarchical and colonial British rule. "It is widely believed that Gamal, now 46, is being groomed to succeed his father, Hosni, 82, as Egypt's next ruler. The younger Mubarak accompanied the presidential delegation to peace talks in Washington this month. "Parliamentary elections, which the opposition wants boycotted, are due in November and presidential elections will be held in September next year." The Guardian said the protest also spread to Alexandria, where it was reported that 30 demonstrators were arrested and women had their clothes torn. In Cairo journalists were among those beaten. "They have been beating us. You can see the blood on my neck. We are a republic, not a kingdom," said a supporter of Mohamed ElBaradei, who formerly ran the International Atomic Energy Agency and is considered a potential rival presidential candidate to Gamal Mubarak. "If Gamal Mubarak becomes president, this country will go to hell. He cares only about businessmen. "The people of Egypt are all dying. We are dying of poverty and we are dying of a lack of freedom." Referring to the 1882 uprising, when Ahmed Orabi declared that Egyptians should no longer be slaves, the protester said: "After 30 years of Hosni Mubarak's rule we are saying the same thing today: we should not be slaves." Later protesters tried to break out of the security cordon. Sympathetic bystanders threw in water bottles to trapped demonstrators. Another protester said: "I am 30 years old and I still have not got enough money to marry. I can't find a job. Tell the world to help us. We are dying under Mubarak. Send an SOS." He then set fire to a picture of Gamal Mubarak. "We are supposed to be a democracy even though everyone knows it's a sham. We will not stand by while the presidency passes from father to son." Added the newspaper: "Gamal Mubarak has long been associated with a series of neoliberal privatisation reforms which have proved unpopular with many Egyptians." A RESISTANCE group behind a wave of car arsons in Argentina has released this communique, posted on Angry News From Around the World. We took to the streets again to practise what we say with our words and think with our brains. 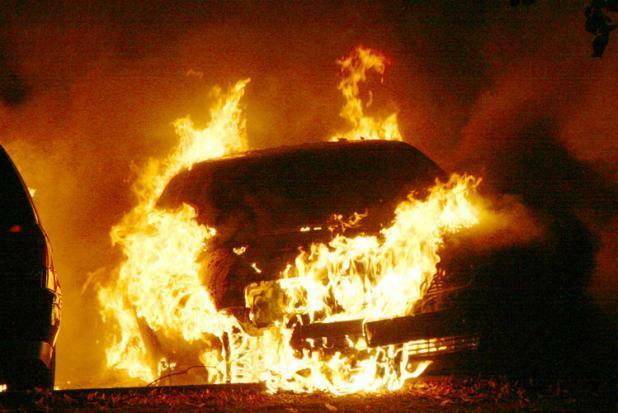 We feel the need to do so because, as we can see, a newspaper published an article in Villa Devoto about the burning of car in the barrio in which it speaks explicitly of the arrest of a person allegedly responsible for the attacks. For this reason we are making it known that what they are saying in this newspaper and / or the police themselves is just a lie, they probably have not caught anyone, or if they did, they got a person who has nothing to do with this. That is why yesterday, September 15, 2010, at the intersection Melincue Chivilcoy we set fire to a car around 23 hours. In addition, we claim responsibility for the burning of other cars before that. As we always say, we are doing this to combat the destruction that society is causing to the earth, that is why we're not on its side and with these actions we are warning that we will continue to attack it to stop what it is doing to the world. We know that they care little or nothing of what we say, but we won't get lost in chatter and writings, something that has already been done. Only the comrades will understand, while those subjected to this system are so locked into the routine of work they have "need" of machines. We try to live differently. PROTESTS have been held all over the world calling for the Khimki hostages to be released. Events in support of Gaskarov and Solopov were also held in St Petersburg, Moscow (pictured), Irkutsk, Tyumen, Kaliningrad, Kiev, London, Paris, Dusseldorf, Stockholm, New York and Seattle, among other cities. The St Petersburg Times report explains the two activists were imprisoned after an anarchists’ protest in front of the headquarters of the Khimki administration, which is instrumental in destroying the Khimki Forest to make way for Prime Minister Vladimir Putin-backed toll highway project to connect Moscow and St. Petersburg. On Sunday, an estimated 150 St. Petersburg anarchists, Antifa activists, environmentalists and residents gathered to demand the release of Alexei Gaskarov and Maxim Solopov, who were arrested a day after the much-talked-about July 28 demonstration in Khimki in which several hundred participants firing pellet guns and setting off flares left graffiti on the walls of the administration building and broke several windows. The protest in Khimki was a surprise for the authorities, who have deployed massive police forces to the forest, where preservationists held a vigil to put pressure on them. The few police patrols at the scene drove away, apparently discouraged by the number of protesters, and did not detain anyone. Gaskarov and Solopov, high-profile Antifa activists, were detained in Moscow a day after the July 28 rally in what their fellow activists describe as an act of revenge. Their guilt has not been proven. Charged with disorderly behavior, they face up to seven years in prison. "It’s not that they were targeted by chance; they were targeted deliberately, because they were anti-fascist movement activists who did not hide their faces, appearing constantly on television, at rallies and other social events,” said Dmitry, an activist with Autonomous Action and an organizer of the St. Petersburg rally. He asked for his last name to be withheld. Because the police failed to detain anybody during the demo when the Khimki administration building was damaged, they wanted to arrest somebody as a scapegoat,” he said. Gaskarov and Solopov are not allowed to see their relatives, Dmitry said, adding that the police investigation has been declared “closed,” forcing the activists’ first lawyer Mikhail Trepashkin to resign over the investigators’ demand that he sign a written oath promising not to speak about the case. “Trepashkin had to resign in order to help the public campaign for their release,” Dmitry said. 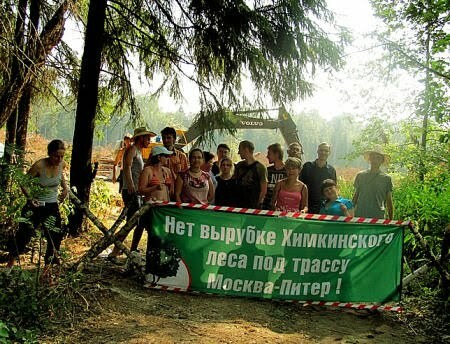 Activists say that the rally in which the administration building in Khimki was damaged was held when they felt that all other measures taken to save the forest during the three-year struggle had proved ineffective in stopping construction. “There has been a struggle which lasted for three years against the corruptors, the crooks who were destroying the Khimki Forest, but it didn’t yield any result — quite the opposite, several ecologists and journalists have suffered, such as Mikhail Beketov who has been left permanently crippled after an attack on him, while the OMON special task police and neo-Nazis have been deployed against the environmentalists,” Dmitry said. The campaign’s rallies were held between Sept. 17 and 20 in anticipation of a court hearing on the activists’ case due later this month. 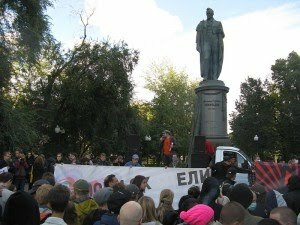 “A wave of repressions against anti-fascists has begun,” Dmitry said. Dmitry said that several activists were beaten and injured during interrogations in Moscow and the Moscow Oblast. “The campaign is also against the repressions that are raging now, mostly in Moscow,” he said. President Dmitry Medvedev ordered a halt to construction of the Khimki highway on Aug. 26, after a substantial portion of the forest had already been cut down. Tree-felling could be resumed at any moment. Information about the campaign is available in several languages at www.khimkibattle.org. A PROTEST is to be held in London as part of the global solidarity campaign over the battle to protect Khimki Forest. Says a posting on Indymedia: "A picket of the Russian Embassy in London is to be held on Monday September 20th. "The protest is part of a series of international actions in defence of the Khimki hostages. These are two grassroots antifascist activists (Alexei Gaskarov and Maxim Solopov) who are currently in custody in Moscow on fabricated charges facing the prospect of very heavy prison sentences.
" "The campaign they are part of put a temporary halt to construction of a planned Moscow-Petersburg toll highway through the Khimki Forest. "In essence, they have been taken hostage by local authorities and police officials. If they are tried and convicted they could face seven years in prison. "Meanwhile, police and other law enforcement agencies continue their hunt against other activists, especially those with connections to the antifascist movement. "Over the past three years, forest defenders have suffered numerous arrests and other forms of harassment by local police, as well as physical attacks carried out by 'anonymous' hired thugs, including neo-Nazis. "These actions by the Khimki administration and its partners are explained by the significant commercial interest they have in seeing that the highway construction project is completed. "The next pre-trial detention hearing for the two young men is scheduled for late September. International Days of Action are taking place to demand their release.
" Our main slogans are Freedom for Alexei Gaskarov and Maxim Solopov! and End the Persecution of Forest Defenders and Antifascists! For more details, go to the Khimki Battle website. Picket the Russian Embassy, 13 Kensington Palace Gardens, from 5.45pm, Monday 20th September. High St Ken tube. Banners and placards welcome. 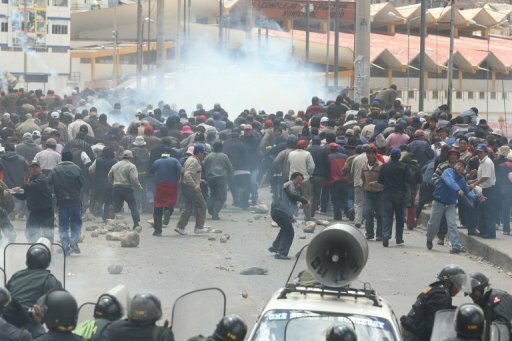 ONE man was killed and many others injured in Peru during protests against a proposed dam. While corporate news sources like Reuters initially claimed the victim, Leoncio Fernández Pacheco, was a bystander and implied his death was accidental, Peruvian media are now admitting he was probably shot by police. 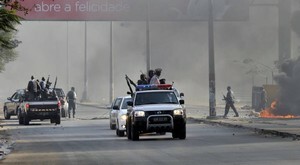 The conflict took place before dawn on Thursday in the town of Espinar, 400 miles (650 km) south of Lima. The Majes-Siguas II irrigation project will leave Espinar without water, say residents. They were enraged when the state investment agency awarded a concession on Monday for the project to a private consortium called Angostura-Siguas without listening to their concerns. Peru's government has encouraged the growth of export-oriented agricultural farms and the petroleum industry. Last year, three dozen people died in a clash over land in the Amazon jungle where indigenous tribes are resisiting the destruction of their land by oil exploration. A CALL has gone out for international solidarity with the defenders of Khimki Forest in Russia. They are now threatened with up to seven years in prison for disorderly conduct, although there is no evidence of their complicity in illegal activities. Meanwhile, the police continue to hunt down and harass other activists, especially those involved in the antifascist movement. Says the Campaign for the Release of the Khimki Hostages: "After the July 28 demonstration, the Russian police and secret services unleashed an unprecedented dragnet against antifascists. "People who had even just once come to the attention of the Centre for Extremism Prevention and FSB for their involvement with the antifascist movement have been forcibly taken in for questioning. "In several cases they have been subjected to harsh physical coercion in order to compel them to give the testimony required by investigators. "In addition, illegal searches have been carried out in their apartments. All these actions on the part of law enforcement authorities are violations of Russian and international law. 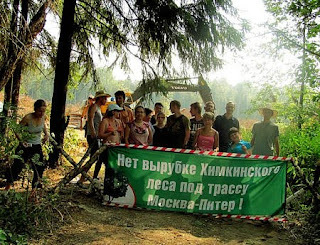 "Frightened by the numerous and growing protests against the clear-cutting of the Khimki Forest, the authorities have finally made concessions by agreeing to review the advisability of the planned route for the toll highway. But this does not mean victory. "Alexei Gaskarov and Maxim Solopov are still in police custody for no reason at all. They are hostages of the authorities. "In late September, the next hearing in their case will take place. The judge will decide whether to keep them in police custody pending completion of the investigation and trial. "Everyone who cares about the fate of these two young men must do everything in their power to see that they are set free. 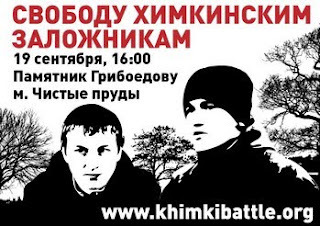 The Campaign for the Release of the Khimki Hostages calls on people around the world to organize days of action on September 17, 18, 19, and 20 to pressure the Russian authorities to release Alexei and Maxim. "We ask you to hold protests outside of Russian Federation embassies, consulates, trade missions, and cultural centers, as well as at public events and concerts connected to Russia. "We also ask you to send faxes, e-mails, and protest letters to the court, the prosecutor’s office, and the country’s political leadership. In the very near future we will inform you of addresses where you can send these protests as well as more details about the ongoing repressions in Russia. " 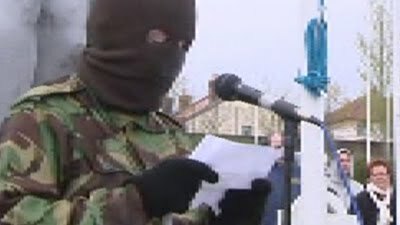 BANKERS are on the target list for dissident Irish republicans in the Real IRA, according to a Guardian interview with the underground group. The Real IRA described bankers as criminals and told the newspaper: "We have a track record of attacking high-profile economic targets and financial institutions such as the City of London. The Real IRA also told the Guardian that support for them was building and they had turned away hundreds of young disaffected nationalists because they didn't have the capacity to absorb so many members. "From the point of view of republican communities, there is still a heavily armed British police force that casually uses plastic baton rounds, CS gas and Tasers, carry out house raids, stop and search operations and general harassment. "There's still a 5,000-strong British army garrison, a new MI5 HQ in Belfast, and a British secretary of state. Republican communities are still subjected to sectarian parades and the right to protest is being met with intimidation and violence." 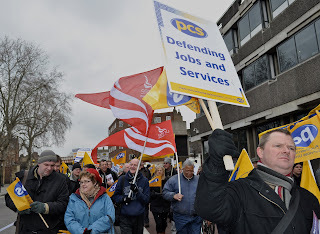 UK UNION leaders warned of strike action as they urged the public to join millions of workers in a campaign to halt government plans for the deepest budget cuts since World War II. Unions representing more than 6 million workers voted today to coordinate industrial action and build support for public demonstrations, reports Bloomberg. The unions, which are meeting at the Trades Union Congress’s annual convention in Manchester, want to be ready to act as soon as cuts are announced next month. “Industrial action is inevitable unless the government is prepared to change direction,” Mark Serwotka, general secretary of the 301,000 member Public and Commercial Services Union, told delegates. Widespread public support for the unions’ campaign would threaten to derail Chancellor of the Exchequer George Osborne’s program that has so far won the backing of bond investors and rating companies. Meanwhile, state propaganda in support of the neoliberal 'austerity' measures may also be under threat. Reports The Guardian: "The BBC's coverage of chancellor George Osborne's spending review on 20 October faces disruption after broadcasting unions today announced strike dates in their dispute over pension scheme changes. "The National Union of Journalists, Bectu and Unite today rejected BBC director general Mark Thompson's latest revised pension reform offer, communicated to staff by email earlier in the day, and confirmed two 48-hour strikes designed to cause maximum disruption to the corporation's coverage of key political events this autumn. "They intend to strike on 5 and 6 October, which would disrupt coverage of the final two days of the Conservative party conference, and 19 and 20 October, to coincide with Osborne's announcement of the scale of government cuts in the Treasury's public spending review." THOUSANDS marched through the streets of Thessaloniki in protest against neoliberal austerity measures being imposed by PM George Papandreou. 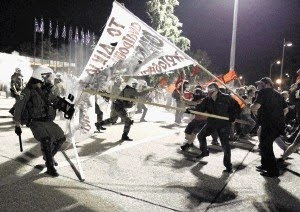 Reports From The Greek Streets: "Two big demonstrations took place tonight in Thessaloniki under the rain. "More than 20,000 people totally marched to Velidio Conference Center according to the police, while the PM was giving his talk. "Minor clashes took place in front of the building, where the cops used chemical gas against the demonstrators in order to push them back from the gate. "Papandreou in his talk announced lighter Businesses’ profit taxation (from 24% to 20%), privatization of the National Railways and privatization of the State Electricity Company and of other public companies. "Earlier in the noon, a demonstrator threw a shoe to the PM in front of the International Exhibition’s Center. "A couple of hours later, the president of Athens’ Industrial and Commercial Association (EVEA), named K. Michalos, was attacked by demonstrators on his way to meet the PM in Macedonia Palace Hotel. "Michalos is notorious from his regular media appearances, where he defends passionately the governmental austerity measures. Riot police intervened and saved him. "More than 4,000 cops are in Thessaloniki in order to police the ministers and the rest of their followers who are visiting the city." 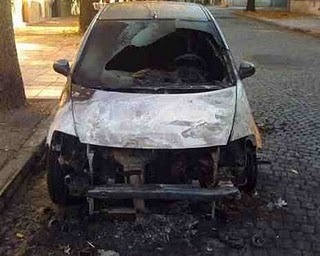 HAMBURG has been hit by a spate of arson attacks on cars, spreading a form of insurrection that has been flourishing in Berlin. The Direct Action in Germany site reports that hardly a night goes by in the north German city without cars being burnt. After 13 were torched in the early hours of Thursday morning, another five were destroyed the next night in Marienthaler Straße in the Hamm district. Police have said that four were set alight and the fifth caught fire in the resulting blaze. The attacks have received mainstream media attention, in the likes of Stern, Welt and the local Hamburger Abendblatt. 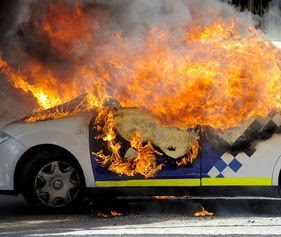 It is estimated that some 120 cars have been torched in Hamburg this year. 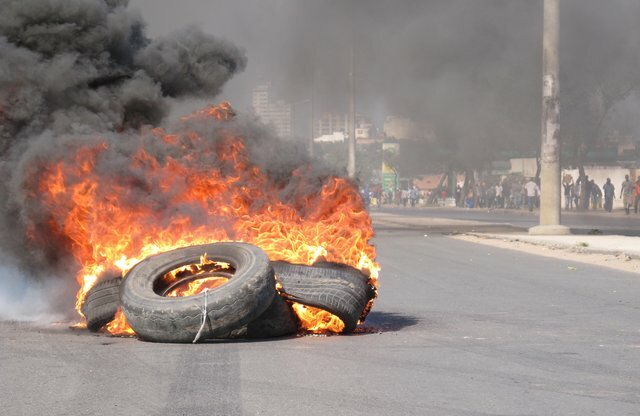 PEOPLE power has notched up an important victory in Mozambique, with riots forcing the government to reverse a huge rise in the price of bread. Reports Times Live: "The 30% rise in the bread price as a result of soaring wheat prices sparked the worst riots since 2008 in the country. "President Armando Guebuza's government had said it had been forced to increase bread prices because of the spike in wheat prices, which was linked partly to drought and fires in Russia. "The United Nations special rapporteur on the right to food, Oliver de Schutter, warned yesterday the riots should be a wake-up call for governments that ignored food security problems, which arose two years ago. "Police fired rubber bullets, live ammunition and tear gas during the three days of protests against higher bread prices and rises in water and electricity tariffs last week. "The price hike took the price of a bread roll - the bread staple of Mozambicans - to R1.45 in a country where the average person is paid about R267 a month." The government said it would put in place austerity measures to help fund subsidies by freezing allowances and pay rises for senior state officials. Foreign travel by officials would be limited. PROTESTERS are claiming victory after Tony Blair cancelled another central London event in the face of angry opposition. 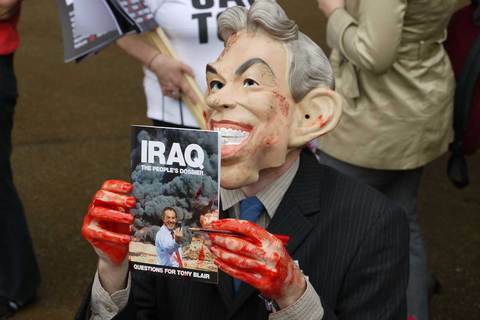 The Press Association reported that the former British Prime Minister called off a party to mark the launch of his new book because he said it would be "frightening" for his friends to have to walk past anti-war protesters. 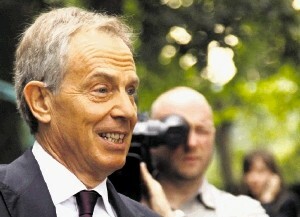 Following an egg-throwing protest in Dublin, Blair had already cancelled a book signing at Waterstone's in Picadilly. Such is the mistrust that surrounds Blair and his PR machine that protesters turned up anyway at the gallery in Bankside in case news of the cancellation was a hoax. A report on Indymedia says they staged a mock book-signing for the many cameras, with a Blair-masked bloody-handed actor signing copies of a booklet called "Iraq: a people's dossier - questions for Tony Blair". Meanwhile two activists scaled the scaffolding at the front of the House of Parliament for an anti-war banner drop. They are protesting about the Afghanistan war prior to a commons debate on Thursday and vowed to remain on the front of parliament overnight and until the debate. MILLIONS of people took to the streets of France on Tuesday to oppose the neoliberal attack on the retirement age being carried out by unpopular president Nicolas Sarkozy. Reports Sky News: "The public sector walkout brought much of the country to a standstill, with transport, schools, hospitals and postal services affected. 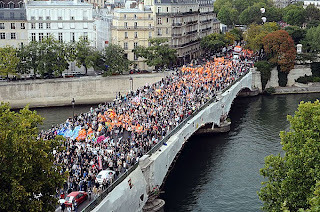 "The French Interior Ministry said more than 1.1 million people took part in the demonstrations to mark the strike, but the CFDT union put the figure much higher at 2.5 million. "Marches took place in 220 locations across France. "President Nicolas Sarkozy wants to raise the age of retirement from 60 to 62. "He says the measures are necessary if France is to combat its rising budget deficit. The new legislation is being discussed in parliament. "But outside, on streets across the country, there were angry demonstrations. The unions are furious. "They claim Mr Sarkozy governs only in the interest of the rich and that the ruling elite should pay for the financial crisis - not rank and file workers. "They say they have the people on their side and the President is now facing a 'perfect storm' of protest. "Mr Sarkozy's approval ratings have continued to fall across the summer. His government has been badly damaged by a corruption scandal involving France's richest woman Lillian Bettencourt - the L'Oreal heiress. "The man at the centre of the imbroglio is also the labour minister, Eric Woerth. He, as it happens, is responsible for driving through the pension reforms." TONY Blair has cancelled a book signing in central London through fear of angry protests outside - but demonstrations continue. His first promotional appearance in Dublin on Sunday attracted considerable opposition, with eggs and shoes thrown at him and one young woman trying to make a citizen's arrest for war crimes. There were plans for protests in Piccadilly, London, for his second book signing event on Wednesday. In the capital, the focus is now on the Tate Modern in Park Street, Bankside, London, where the former Prime Minister is staging a party to celebrate the launch of his autobiography. Protesters are being urged to gather outside from 5.30pm on Wednesday September 8. Despite the best efforts of his PR machine, it is clear that Blair remains the most widely despised figure on the British political scene. AMERICA'S claim to have 'ended combat operations' in occupied Iraq has quickly been exposed as a lie. Some of the 50,000 US troops still in the country were involved in defending an Iraqi army base in Baghdad from an attack by resistance fighters on Sunday. 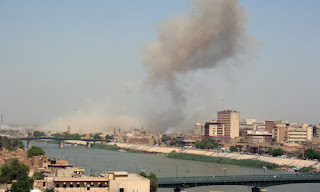 Reports The Washington Post: "The assailants detonated a car bomb outside an army division headquarters housed in the former defense ministry building, killing at least 12 people, most of them Iraqi soldiers, authorities said. "The blast wounded at least 20 people at the complex, where a bombing last month targeting recruits killed more than 60 people. "A gun battle raged for more than two hours after the explosion as Iraqi soldiers tried to corral the two bombers who managed to get inside the base, Iraqi officials at the scene said. A small contingent of U.S. soldiers is based at the facility. "The assailants, who wore vests rigged with explosives, threw grenades as Iraqi soldiers shot at them from a distance, fearing that their bullets could detonate the bombs. "American soldiers backed them up with 'suppressive fire', said Lt. Col. Eric Bloom, the U.S. military spokesman. U.S. helicopters, drones and explosives experts also responded." "NOW you know why the police are called the Filth." This is not a quote from an anarchist blog but one of the 'best rated' comments on the website of the conservative UK newspaper The Mail. The site includes a video showing how "burly police sergeant flings an innocent 5ft 2in woman on to a concrete floor, knocking her unconscious". Former soldier Mark Andrews has been convicted of assaulting 57-year-old market researcher Pamela Somerville. And The Mail points out: "The incident, in the sleepy Wiltshire market town of Melksham, will inevitably stoke debate about the deteriorating relationship between the public and the police following the death of newspaper vendor Ian Tomlinson, pushed to the ground by a police officer during last year’s G20 protests." "The police should never be above the law, but they always are." "This is how police brutality is allowed to flourish because the other officers are keeping quiet and typically not protecting the public they are paid to protect." "Makes you wonder how many more like him in the police." "Cowardice seems to be prevalent in our Police force." "No wonder so many people now have such contempt for them." 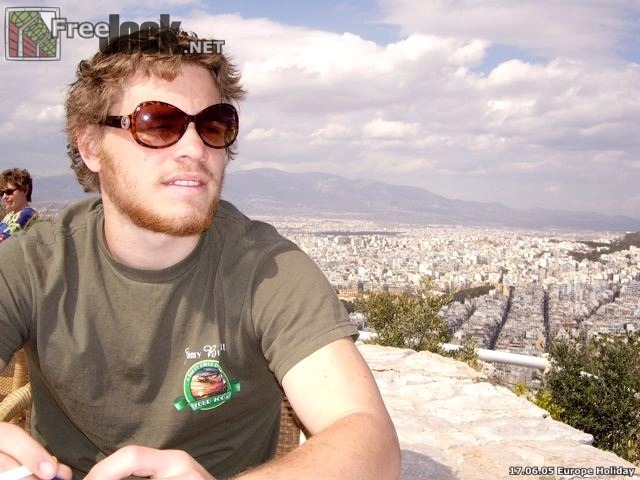 AN INTERNATIONAL day of solidarity has been called in support of Jock Palfreeman, an Australian activist who stood up to a gang of violent Nazis in Bulgaria. The Anarchist Black Cross reports that the 23 year old witnessed 16 fascists chasing and attacking two young Roma boys in Sofia. "Jock has since been tried and sentenced for murder and attempted murder. He has been sentenced to 20 years imprisonment and has been fined £220,000. "Jock has its appeal on 21st of October- it is his only chance to walk free. We need to do everything we can in order to get him out of there. "An international Day of Action for Jock on has been called on the 19th. If you can organise an event in your area please contact: anarchosolidarity(at)yahoo.com . It is also of vital importance to keep up the pressure with protest messages and smaller actions up till this time." Adds freejock.net in Australia: "In support of Jock there will be an event held on Saturday 16 October 2010 Sydney, Circular Quay commencing from midday. "More information will follow shortly, please keep this time free to come and show your support.There will be other events held throughout Europe, UK and the USA so please contact freejock(at)live.com.au for all these details. ANGRY protesters greeted war criminal Tony Blair in Dublin when he staged the first of a planned series of book signings, with eggs and shoes thrown at him. And the call has now gone out for more protests when he appears in central London on Wednesday this week. Reports The Guardian: "Three men were arrested after they broke through a security barrier at around 10.45am today outside Eason's bookshop on O'Connell Street in Dublin, Ireland. "The demonstrators, ranging from anti-war demonstrators to the Continuity IRA-aligned Republican Sinn Fein are now marching to a garda police station in the city centre demanding the release of the three arrested men. 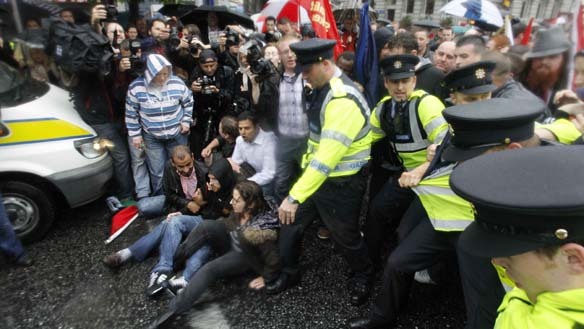 "Gardai had earlier dragged a number of demonstrators off the street and during the fracas a male protester in a wheelchair was knocked to the ground. One anti-war campaigner has attempted to make a citizen's arrest on former prime minister Tony Blair over alleged war crimes, reports the Press Association. Activist Kate O'Sullivan managed to get through tight security to confront Mr Blair as he held a book signing in Dublin. "I went up to him and I said 'Mr Blair, I'm here to make a citizen's arrest for the war crimes that you've committed'," she said. There are calls for protests in London on Wednesday September 8 when Blair is due at Waterstones Picadilly, 203-206 Picadilly, at 12 noon. Says Counterfire website: "Join us to demonstrate against Tony Blair's book-signing and bring banners and something which will make a lot of noise!" FOOD riots have broken out in Mozambique, one of the poorest countries in the world. 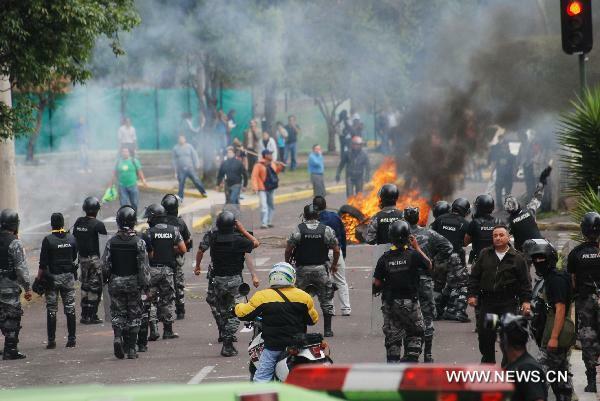 Protesters staged a second day of strikes and demonstrations on Thursday over food price increases and the violence has so far left seven people dead and 288 wounded, the government admits. Reports Times Live: "Clashes between police and protesters broke out Wednesday and Thursday, as crowds in impoverished neighbourhoods on the outskirts of Maputo took to the streets. "They were protesting a 17-percent increase in the price of bread, as well as fuel, water and electricity rises. "Protesters looted 23 shops and damaged 12 buses, completely destroying one, government spokesman Alberto Nkutumula told journalists after an emergency cabinet meeting Wednesday. "Despite posting impressive economic growth figures since the end of a 16-year civil war in 1992 Mozambique still has a per capita income of just 794 dollars (620 euros) a year." LOCAL resistance has halted the building of a controversial new motorway through a self-built settlement near Mexico City. Reports Narco News: "When Mexico City mayor Marcelo Ebrard and his government announced its plan to build a private superhighway from the south of the city to the country’s bustling and affluent Santa Fe financial district in the west, they didn’t have a plan for an organized resistance arising from the residents of La Malinche, a colonia that is set to be destroyed by the construction. "Ever since the government brought its first bulldozer into the neighborhood to demolish buildings in July, residents have successfully halted construction. They organized an indefinite sit-in to protect their neighborhood. 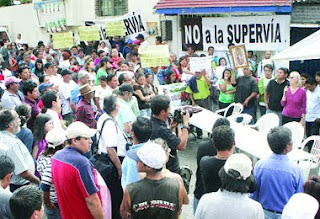 "For more than 30 days now, the government has been unable to build, and the people of La Malinche, who have now created the Frente Amplio contra la Supervía Poniente (Broad Front Against the Western Superhighway), say they aren’t planning on going anywhere. "Located outside of Mexico City’s subway system in the southwest, La Malinche is a neighborhood of housing projects and buildings that crawl up a steep incline to a hill that overlooks the city. The narrow streets leading up to the hill bend frequently, giving the impression of a maze, and on the walls in the colonia there are spray painted slogans that proclaim 'No to the superhighway!' and curse the city’s mayor. "The city government is continuing with its plans to build the private highway. Barred from La Malinche, construction crews and their machines have already begun work in La Angostura, a colonia located on the opposite side of the hill, where residents have been forced to leave their homes. "Neighbors don’t want to end up like the people in La Angostura, and they don’t want to see the government and a foreign corporation ruin what took their families decades to build. 'Our parents and grandparents fought so that we can be talking here,' says José Lopez Perez, 24, who helps guard one of the plantones. 'Today, now it’s we young people’s turn to fight for this place'."